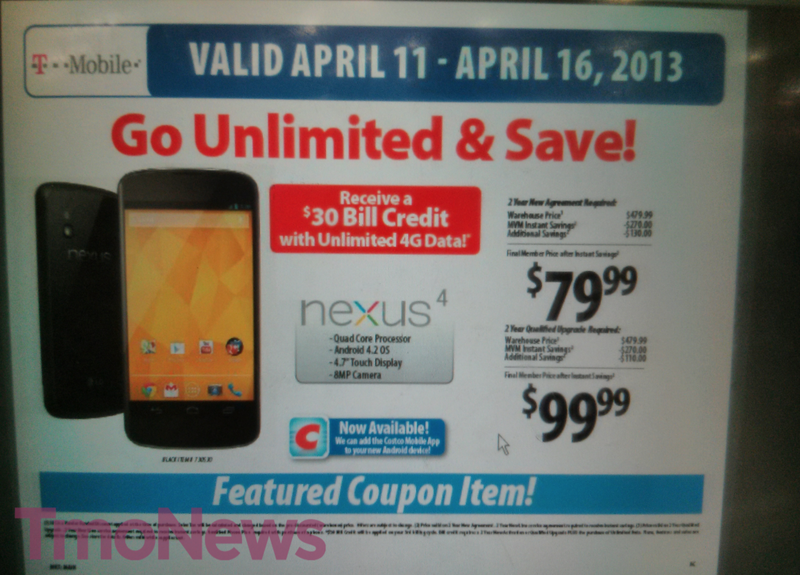 Not to be overshadowed by the trifecta launches of the iPhone 5, HTC One and Galaxy S 4 on T-Mobile, Costco is pushing an attractive offer on the Nexus 4. If bone stock Android and guaranteed first dibs at software updates is your thing, a $79 price tag for new customers or $99 for qualified upgrades may be right up your alley. As a quick reminder, as a national retailer Costco can only push the new Classic Plans and these prices apply only to Classic Plan offerings with a two-year agreement. The Nexus 4 needs little introduction around T-Mobile land and if the price tag doesn’t do enough to get you out of your chair, perhaps the $30 bill credit with unlimited data will. Grab this offer soon, as it ends next Tuesday, April 16th. So what’s the true cost after 2 years? $1,519 + taxes, assuming you go with the cheapest plan. Cheapest classic plan would be with 2gb data. Individual plan would be 79.99 a month and family line would be 69.99 a month. Thats $1920 or $1680 not including the taxes and the cost of the phone. $49.99 on the T-Mobile site. so you’re still better off buying from google play store and putting it on a value plan, no? This phone would be perfect if it came in 32GB and 64GB. Only reason I passed on this. 8 and 16GB is useless to me without a SD slot.